So I was having a few brews over in the WordPress Tavern earlier today when I stumbled across a new wordpress theme called Portfolio. The full details of the theme can be found on the main Portfolio Theme details page. 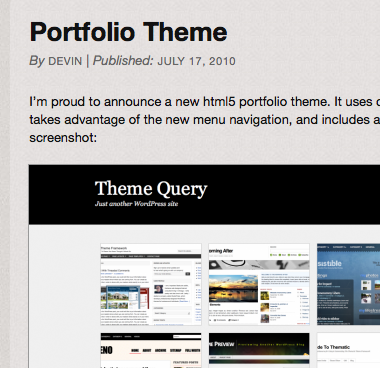 After taking Portfolio Theme for a quick spin in the themesforge labs I must say I’m impressed. Devin from wptheming.com has put together a really solid WordPress theme that utilises the new WordPress 3.0+ custom post types functionality to create a slick Portfolio manager that incorporates a featured image feature. I could see many different uses for this WordPress theme but I think it will particularly suit any freelance designer or web agency who wishes to create a simple but effective portfolio based website. Well done Devin and looking forward to seeing more of your work!